Cambodia has marked the 24th anniversary of the end of brutal Khmer Rouge rule, as talks restarted to bring those responsible to trial. Hundreds of balloons and doves were released in the capital, Phnom Penh, as the head of Cambodia's ruling party urged justice for ex-Khmer Rouge leaders, none of whom have yet faced trial. "Although time flies, still it cannot allow Cambodians to forget the most bitter, painful and indescribable past that they suffered during a period of three years, eight months and 20 days under the genocidal regime," Chea Sim told about 5,000 people at the Cambodia People's Party headquarters. The anniversary came as a Cambodian Government delegation resumed negotiations with United Nations officials in New York over the establishment of a special court to try former members of the Khmer Rouge. It is the first real contact between the two sides since the UN pulled out of talks early last year, amid concerns that the court would not be guaranteed the necessary standards of independence, impartiality and objectivity. UN head Kofi Annan only agreed to new talks after members of the UN General Assembly passed a resolution in December requesting a resumption of negotiations to set up the court. Officials at the United Nations are describing these new negotiations as "exploratory" talks. A key sticking point in the past has been an insistence by Phnom Penh that Cambodian national law would prevail over the court. France, the United States and Japan have all supported the calls for renewed UN involvement in the court. They fear that without UN support justice may never come to those responsible for a particularly violent episode in Cambodia's history. An estimated 1.7 million people died under the Khmer Rouge's ultra-Maoist rule - from torture, execution, starvation and disease. But not everyone was celebrating the end of Khmer Rouge rule on Tuesday. 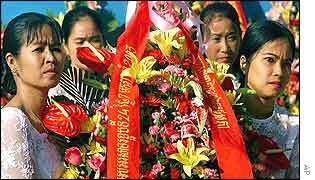 Although 7 January, 1979, was the day the Khmer Rouge regime was toppled by invading Vietnamese troops, it also marked the start of a 10-year occupation by those troops. Dozens of democracy advocates marched outside the national assembly in protest against the Vietnamese invasion. Khmer Rouge guerrillas actually battled on from jungle strongholds during Vietnam's occupation until 1998. Several senior Khmer Rouge leaders still live freely. Only two - former military chief Ta Mok, and the head of the notorious Toul Sleng holding camp, Kang Kek Iue - are in jail, pending trial. "The UN is trying to re-start talks to establish a genocide court"
"The bitter grievances from the past will never be settled"
"The best solution would be a tribunal outside of Cambodia"